The Shure ULX-S24 Receiver and Wireless Handheld Microphone Kit from B&H includes the Shure ULXS4 standard wireless receiver with PS40 power supply, the ULX2/58 UHF handheld transmitter with an SM58 microphone head, the WA555 external grip (switch cover) for the transmitter, UA507 rackmount hardware for dual ULX receivers, a WA371 swivel adapter, zippered transmitter carry bag, a 9V battery, and a small adjustment screwdriver. 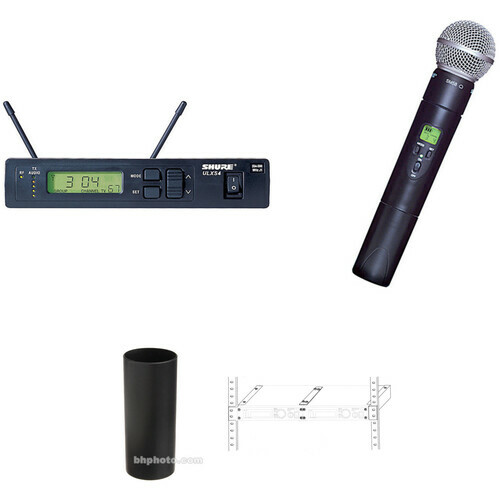 This kit can be used to capture audio for live stage, theater, rehearsal, speech, vocal, and presentation applications. The ULX2/58 UHF Handheld Transmitter with SM58 Microphone Head features a Shure SM58 cardioid capsule. It can be used when paired with a ULXS4 receiver (sold separately) to capture audio for speech and presentation applications. The ULX-2 transmitter provides 1400 user selectable frequencies. A comprehensive LCD display provides channel and frequency information and monitors battery life. The cardioid polar pattern is effective against off-axis noise, which causes feedback and unwanted ambient noise. Built with rugged construction, an integrated shockmount system and a steel mesh grille ensure that even with rough handling the SM58 will perform consistently. Outdoors or indoors, singing or speech, the ULX2/58 UHF Handheld Transmitter with SM58 Microphone Head is a suitable choice for professionals worldwide. The Shure Model WA555 is an external sleeve assembly that provides a textured grip to your microphone while preventing accidental movement of the microphone's side-mounted controls. The (Black) WA555 is for use with the LX2, SC2, T2, U2, UC2, ULX2 or UT2 handheld microphone/transmitters. The Shure UA507 is a rack mount adapter kit for the 2 ULX series receiver. The mount accommodates dual ULX receivers and mounts into a standard 19" rack. External Power Supply - PS40, Included, Now with Locking DC Connector! Display Yes, Power On Indicator, Diversity Signal Indicators and Audio Peak Indicator, Channel, Group, Transmitter Low Battery Warning. Box Dimensions (LxWxH) 18.6 x 14.5 x 4.0"
Box Dimensions (LxWxH) 11.0 x 5.3 x 3.1"
Box Dimensions (LxWxH) 4.8 x 2.7 x 2.0"
Box Dimensions (LxWxH) 10.9 x 5.3 x 3.2"